In a large bowl, whisk together eggs, milk, cheese, mustard, pepper and salt. Add bread, kielbasa, onions and peppers; stir well until the bread is completely absorbed. Cover bowl and refrigerate at least 12 hours. Stir basil into egg mixture. 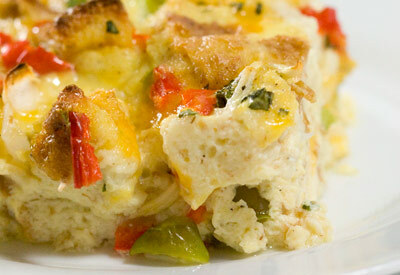 Pour into a 9x13- inch baking dish and bake for 1 hour or until eggs are set.